Informative Video for Liebherr's Largest Mining Haul Truck - T-284 Leaving the Las Vegas Convention Center. 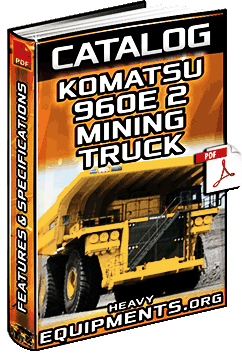 Free Download Catalogue for Komatsu 960E 2 Mining Truck - Features, Specifications, Dimensions & Equipment in Full PDF. Informative Video for The Biggest Mining Truck in The World - BelAZ 75710 Truck with a capacity of 450 tons. in 2017. Informative Video for the Largest Chinese Mining Truck - Wuhan Sanjiang WTW220E Truck with a capacity of 220 t.
Informative Video for Liebherr T282C Mining Truck (Large Off-Highway Truck) - Productivity, Features & Benefits.